Today I start a new series on the blog, something that we thought would fit perfectly with our cooking philosophy. Today is my first day to participate in The Kids Cook Monday, a program sponsored by Johns Hopkins, Columbia University, and Syracuse University that encourages families to cook together by getting the kids in the kitchen. 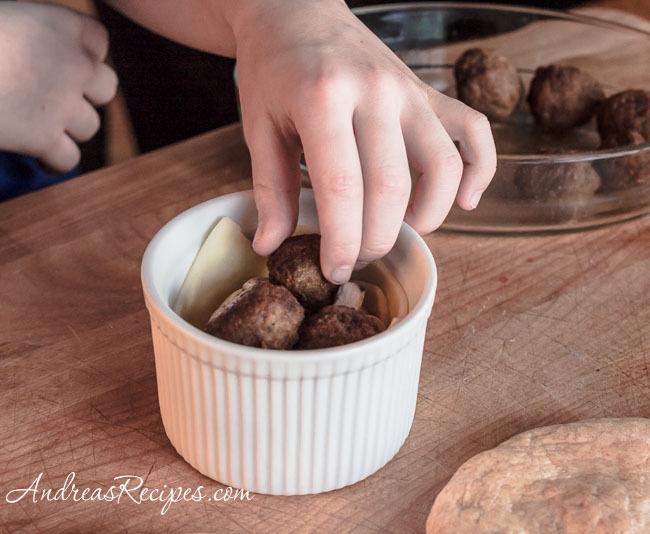 We think it’s a great idea and in our own home we’ve witnessed the boys’ eagerness to help with meals, especially their favorites, and how much more likely they are to try something new when they’ve helped prepare it. So a couple Mondays a month we’ll post recipes that the kids can help make. 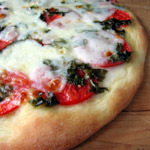 It only seems appropriate to start with one of our boys’ favorite dishes for our first TKCM: pizza. 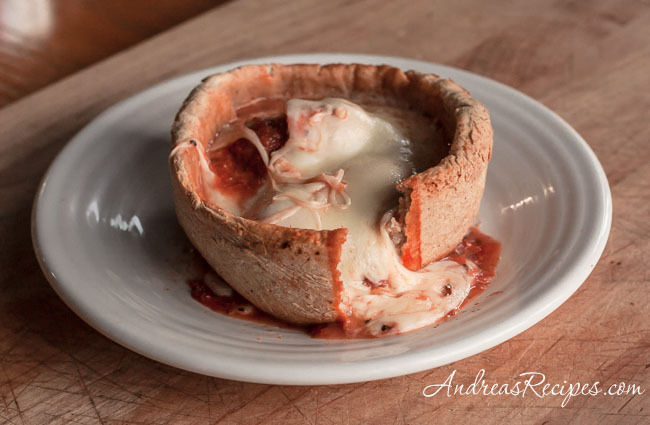 The boys have been helping with pizza for a couple years now, and we thought this famous variation on Chicago deep dish pizza would be fun for them to try. 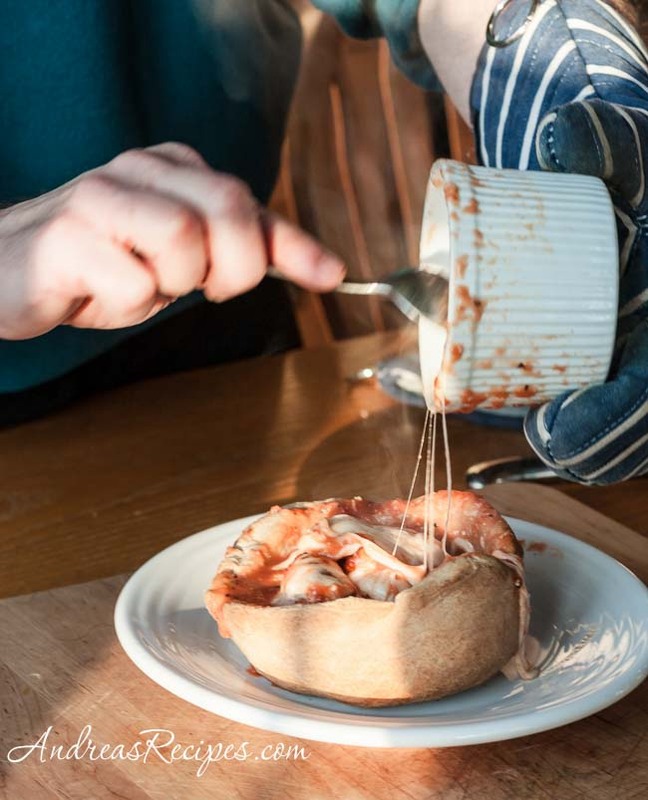 The credit for pizza pot pie goes to Chicago Pizza and Oven Grinder Co. in the Lincoln Park neighborhood, and it’s one of those things that you just have to try at least once. When we made them at home for the first time our oldest son went nuts for it and now he asks every week if we can make “pies.” We made a part whole wheat dough and used the sauce from our Chicago-Style Stuffed Pizza, then just assembled everything like a pot pie. A little olive oil around the inside, then the cheese lines the ramekin. Add the mushrooms and meatballs, or whatever filling you like. Then pour some sauce on top. Rub the outside of the ramekin with more olive oil and cover with a piece of pizza dough. Turn it upside down on a plate and loosen the edges with a spoon. Then twist off the ramekin. Sometimes the cheese sticks a little and you may need to use a spoon to get the rest out, but next time just use a little more olive oil and the cheese will release better. Demonstrate and assist with any tasks that might be new: measuring, mixing, kneading. Open cans or teach older children how to use the can opener safely. 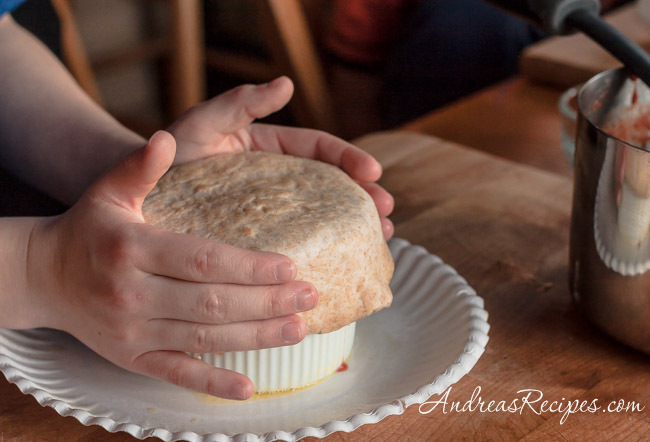 Demonstrate how to assemble one pizza pot pie, then assist the kids as necessary. Young children will likely need help with each step of assembly. An adult should be in charge of turning on the oven, inserting and removing the pot pies from the hot oven, and handling the hot ramekins when serving the pies. If you use a stand mixer for mixing and kneading the dough, encourage the kids to use caution and keep hands and objects out of the bowl when the mixer is on. Have children stand back away from the oven when opening or closing, and when inserting and removing the pies. DOUGH: Mix the bread flour, whole wheat flour, yeast, sugar, and salt in the large mixing bowl. Make a well in the flour and add the warm water and olive oil. Mix and knead thoroughly until the dough clings together and cleans the sides of the bowl. Turn the dough out onto a floured work surface and knead for about 5 minutes, until the dough is smooth and soft. Dust with additional flour if the dough is sticking to your hands. Spread some olive oil around the other large mixing bowl and lay the dough in the bottom, turning it over so that the entire surface is coated with a light layer of olive oil. Cover the bowl with plastic wrap and a kitchen towel. Set the bowl in a warm place to rise until doubled, about 90 minutes. ASSEMBLE: Preheat the oven to 500° F/260° C. Punch down the dough and knead briefly. Divide into 6 equal pieces and shape each into a round about 6 inches across. 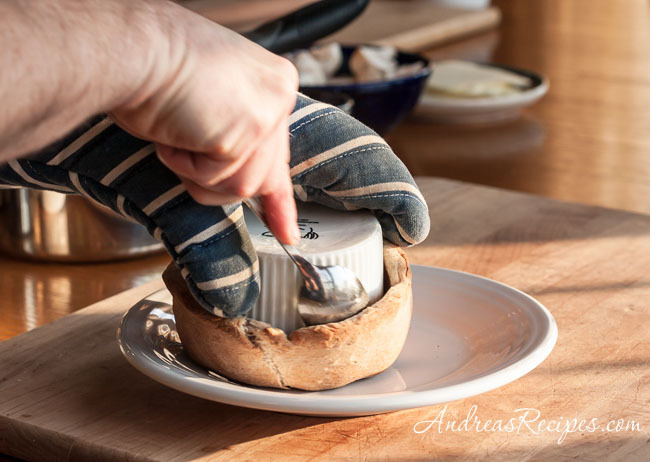 For each pot pie, coat the inside of the ramekin liberally with olive oil (if there is not enough olive oil the cheese will stick during turnout), arrange three mozzarella slices in the bottom and around the sides of the ramekin making sure they overlap. 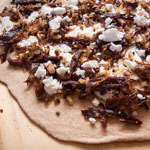 Add mushrooms and meatballs (or other fillings) as desired. Ladle the sauce over the fillings just until the ramekin is almost full. 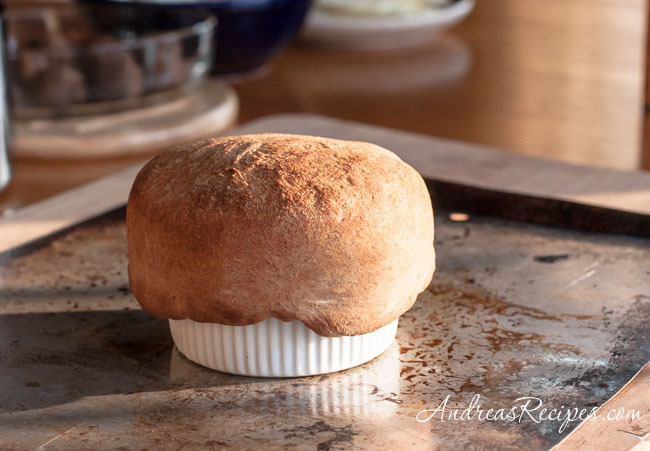 Rub the outside of the ramekin with olive oil, then stretch a round of dough across the top and down the sides to nearly the bottom and brush the top with olive oil. BAKE: Arrange the pies on a foil-lined baking sheet and bake in the preheated oven until they are toasted brown on top, about 15 to 20 minutes. 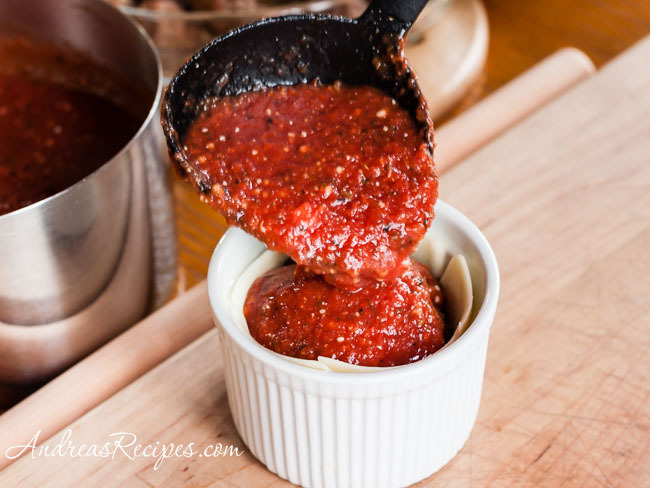 Remove from the oven and transfer ramekins to a wood cutting board or other heat resistant surface. Place a serving plate on top of each pie, then invert it. Turn the bottom of the ramekin with an oven mitt. 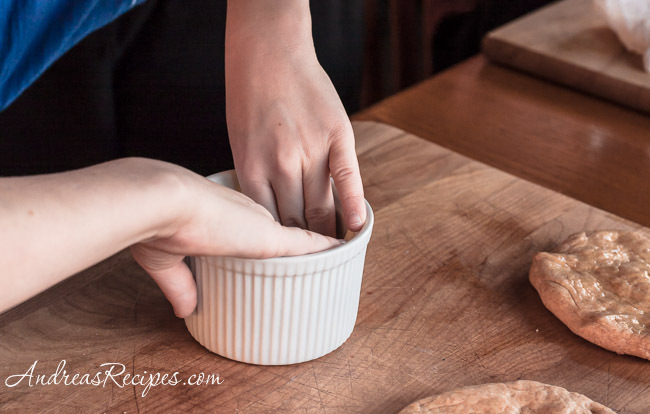 Lightly run a knife or spoon between the outside of the ramekin and the inside of the dough bowl being careful not to slice through the bottom. Gently lift the ramekin out, turning it as you go, and scoop out the cheese if necessary. Use a fork and knife to eat and enjoy. Prep Time includes dough rising time. Fantastic way to get kids to enjoy cooking and eating right! What a huge success in our house! thanks for sharing!! Momgateway, thanks. Yes, the kids really enjoy it. Beth L., we’re so glad you liked it! My kids and I have more laughs cooking together than probably any other activity. 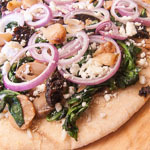 They will love this recipe! omg, this looks amazing! I love love love Chicago-style pizza. I love the pot pie pizzas at Pizza and Grinder Co. Now if only you could make the crazy flat bread too! Love this idea! Definitely have to try it with my Grands! Hi. I’m one of your parents’ neighbors and am really impressed with your web site and photography. (I use to work as a photographer.) Would the pizza pot pie work in a larger pan? Thanks Sheila! I’ve seen the leaves you make, and they are gorgeous! Yes, the pizza pot pie will work in a larger pan, just add a little cooking time depending on how large you go.